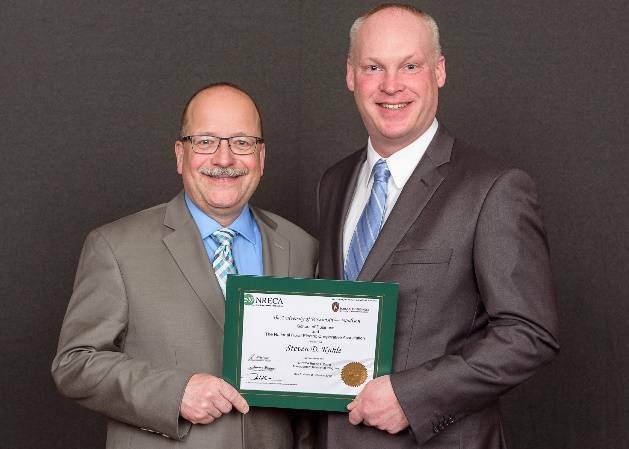 Paulding Putnam Electric Cooperative Engineering Manager Steve Kahle (right) accepts his MIP certificate from Gary Pfann, director of executive staff and education at NRECA, after passing three 10-day sessions with the University of Wisconsin. Submitted photo. PAULDING — Steve Kahle, an engineering manager for Paulding Putnam Electric Cooperative, recently completed the National Rural Electric Cooperative Association’s Robert I. Kabat Management Internship Program, a series of intensive electric utility management workshops held at the University of Wisconsin in Madison. The program is attended by rural electric cooperative CEOs and top-level managers. https://www.limaohio.com/wp-content/uploads/sites/54/2019/04/web1_image003.jpgPaulding Putnam Electric Cooperative Engineering Manager Steve Kahle (right) accepts his MIP certificate from Gary Pfann, director of executive staff and education at NRECA, after passing three 10-day sessions with the University of Wisconsin. Submitted photo.